Azernews' interview with His Excellency ISESCO Director General Abdulaziz Othman Altwaijri. Question: Azerbaijan with a majority of Muslim population is also a home to people of various religions, beliefs and nationalities. How do you assess Baku’s efforts in promoting intercultural dialogue? Answer: The Republic of Azerbaijan deploys great efforts in the field of promoting dialogue among cultures and coexistence among followers of different religions through civilizational initiatives including the annual organization of the World Forum on Intercultural Dialogue, the establishment of the National Center for Tolerance, which translates the principles of tolerance, harmony and coexistence into real-life practices and executive measures which all embody the fruitful cooperation and active partnership between the Ministry of Culture and the national commission in charge of the relations with the religious institutions in the Republic of Azerbaijan, UNESCO and ISESCO. On this occasion, I am pleased to reiterate my great appreciation of the distinguished efforts and the civilizational mission undertaken by the Government of Azerbaijan under the leadership of His Excellency Mr Ilham Aliyev, President of the Republic, to disseminate the culture of peace and values of tolerance; promote dialogue among cultures, alliance between civilizations and coexistence among nations and peoples; deepen larger human cooperation and jointly and continuously work to build a new world order on the solid bases of mutual respect of creative spiritual, cultural and civilizational diversity. I strongly believe that saving human communities from the serious problems that emanate from religious bigotry and ethnic cleansing is one of the major goals of promoting the philosophy of dialogue, renew its contents and modernize its methods and styles in such a way as to make of dialogue a tool for promoting harmony, understanding and rapprochement between the followers of religions and people belonging to different cultures. I also believe that dialogue is the method of wise people who make peace, and that the cultural and intellectual elites as well as the religious and scientific leaderships are at the forefront of those wise people who assume starring roles in the fight against destructive trends which aim to undermine the foundations of dialogue and cooperation between religions, cultures and civilizations and discredit the value of dialogue and the importance of cooperation. Q.: What are the biggest threats that the Islamic world faces today and how to address them? What should be in particular done to promote the Islamic solidarity? A.: The Islamic world is facing many challenges; some of them have accumulated over recent decades, some are caused by the upheavals currently occurring in the world, and some others are the result of subjective factors occasioned by the major problems linked to the polices followed up to now to address these challenges. Indeed such problems have exacerbated to such an extent that they have become an issue of concern given the failure to adequately address them with strong determination, clear vision and rational method that deals with the realities with pragmatic thought likely to reach the heart of truth while avoiding to fall prey to illusions and pipe dreams that emanate from lack of civilizational awareness and deficit in scientific understanding of the nature of those challenges. Amidst the numerous crises faced by the Islamic world, especially the ones occurring now in many parts of the world, including the sectarian wars and conflicts, division, extremism and terrorism, any keen and attentive observer may understand that the challenges besieging the Islamic world at this critical period may not be addressed from a narrow perspective with such limited efforts and means that fail to fully comprehend the developmental dimensions of the battle that the Islamic world must fight and win to move to the battle of renewing the civilizational construction that comprises the political, economic, social, scientific, technological, cultural and intellectual construction. Illiteracy is by far the most serious of all the challenges that besiege the Islamic world and undermine its capabilities. Indeed, it is the source of all the illnesses that have infected the Islamic societies and affected their level of education, as well as all of the other fields of sustainable development in their cultural, economic and social dimensions. Sectarian conflicts are one of the highly serious challenges that are tearing apart the Islamic world. Over the recent period, they have exacerbated because of foreign interference, which seeks to spread destructive anarchy, pit Muslims against each other, incite religious sects to wreak havoc and destabilize the Islamic world. Sectarian conflict is a dangerous threat to the Islamic world for Muslims are one Ummah with one religion, one prophet and one Qibla, and have lived for a long time in harmony, brotherhood and peace. It is only through embracing again the teachings of our noble religion, sticking to the Islamic brotherhood, rejecting all forms of bigotry, intellectual and behavioral aberration, and entrenching Islamic solidarity in the Islamic world that it is possible to eliminate sectarian strife. Q.: What is your Organization’s general plan on promoting mutual understanding among people of different religions and cultures in an effort to prevent conflicts on the religious ground? 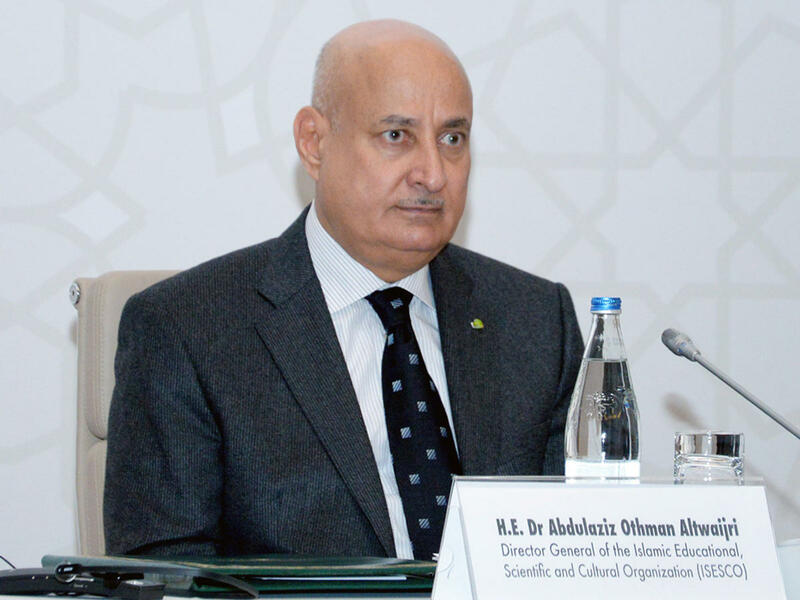 A.: ISESCO is concerned with fostering the values of dialogue among followers of religions, cultures and civilizations, both in Islamic countries and in the world. ISESCO is an active player in the international action in the field of intercultural dialogue. It participates in international conferences on dialogue issues, publicizes the vision of the Islamic civilization to the issues addressed at such international events. Moreover, ISESCO contributes to promoting the values of dialogue, tolerance, coexistence, harmony, understanding, mutual respect, and the dissemination of culture of peace and justice through the conferences and symposia it organizes and the studies and books it publishes. It also does so by calling for the incorporation of these concepts in Member States’ educational curricula, while entrenching the values of moderation and middle stance, sound understanding and judicious religious awareness, with a view to eradicate fanaticism, extremism and denial of the Other. This is an established approach and an adopted policy in all the successive three-year action plans. I have stressed, on many occasion, that upgrading dialogue to a level of comprehensive cooperation can consolidate Islamic and human solidarity to build global peace and disseminate the values of religious harmony on the basis of mutual respect. This constitutes an efficient method to fight all forms and degrees of terrorism and hate; and counter all aspects of extremism, violence, fanaticism and identitarian closure. The more we follow this path and continue working with this spirit, the more we can contribute to enlightening future generations of the truths about religions, good morals, and the noble deeds that incentivize Muslims to work for the good of humanity, more openness to other religions and cultures, and for the service of Sustainable Development Goals (SDGs) which contribute to the stability, prosperity, development and progress of societies and maintenance of security, peace and harmony between nations and peoples. Q.: ISESCO proclaimed 2019 a year of heritage in the Islamic world. How do you evaluate Azerbaijan’s efforts in preserving Islamic culture and architecture? A.: To give effect to the resolution of the 10th Islamic Conference of Culture Ministers, held in Khartoum in 2017, ISESCO proclaimed 2019 a year of Heritage in the Islamic World and released a statement urging Member States to take measures necessary for marking this milestone event, strive to showcase the importance of tangible and intangible cultural and civilizational heritage in preserving collective memory, protecting the identities of peoples and nations, raising the awareness of parties concerned of the urgent need to protect and preserve heritage and ensure its sustainability. In addition, this initiative aims to consolidate the gains which the Organization scored in the Islamic world and give strong impetus to its programmes and projects in this respect, amid special regional and international circumstances, marked, on the one hand, by the growing interest in heritage as a mechanism for the preservation of nations’ collective memory and civilizational and cultural identity and a lever for development, and on the other, by the exacerbating challenges it faces, namely conflicts, globalization, extremism, sectarianism and terrorism, especially in unstable areas of the world. The proclamation of the 2019 as a year of Islamic cultural heritage concurs with the 50th Anniversary of the Arson Attack against Al-Aqsa Mosque. This is a call to governmental and non-governmental bodies inside and outside the Islamic world to seize this sorrowful occasion to contribute to the publicizing, protection and development of Al-Quds heritage, and celebrate Al-Quds Al-Sharif as the Arab region’s Capital of Islamic Culture for 2019 and a Permanent Capital of Islamic Culture. The civilizational and cultural heritage of the Republic of Azerbaijan is known for its richness and diversity thanks to its openness and interaction with multi-source human cultures and the innovations of Azerbaijani intellectuals, scholars, writers, poets, artists, architects, and craftsmen. Such richness and diversity are also owed to the outreach of heritage schools and its cultural and scientific institutions and their abundant production in all fields of knowledge, architecture and artistic expression. In Azerbaijan, various cultures, successive civilizations, multi-source arts and literature have interplayed to turn the country into an abode of tolerant coexistence and true civilizational and cultural dialogue in its deepest sense. Therefore, the Republic of Azerbaijan is one of ISESCO Member States that pay close attention to its cultural and civilizational heritage, both tangible and intangible, as it is a key symbol of their Islamic civilizational identity and a considerable opportunity to showcase its cultural diversity. To this end, Azerbaijan set up prestigious museums, accorded interest to developing cultural tourism, and organized various art and cultural festivals. For these considerations, two of Azerbaijan’s cities were selected as Asian region’s capitals of Islamic culture: the first is Baku in 2009 and the second Nakhchivan in 2018.